It's a simple enough question, and one I get asked from time to time. I've been advertising myself as a 'documentary wedding photographer' for years, but what does that really mean? Documentary wedding photography, as with other forms of documentary photography, is all about telling a story without the need for words - telling a story using only images. In order to fully tell the story of a wedding, I try to ensure that I am there all day with the bride and groom, from start to finish. I don't feel like you can tell a complete story if you're only there for half of a wedding day. One of the important things with documentary wedding photography is keeping an eye out for unusual or quirky images that are quite easy to miss. This image is an example of that ethos. 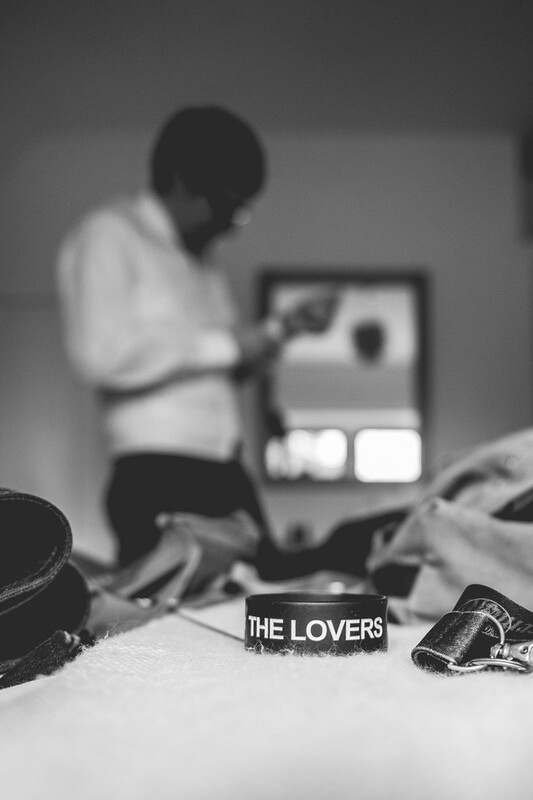 The Lovers are a Sheffield based band that have been around since 2001, and the groom was sporting one of their wristbands before getting changed into his wedding suit. He had dropped the band on the bed in order that he do up his cough links. I had noticed the words on the band, and thought it rather fitting as it was a wedding - I composed the image so that the groom is clearly visible in the background. Without the groom present, this could be a photo that was taken anywhere and at anytime, but with the groom present in the image, it's unmistakably a wedding photo. This is the essence of documentary wedding photography.